If molecules in colder things get denser, why does ice float? Water is the most important chemical to life on earth and perhaps anywhere else in the universe. A chemical is a substance with a specific composition (or ingredients). The most basic chemicals are atoms of elements. These elements can combine to form molecules with specific properties. Water consists of two hydrogen atoms and one oxygen atom bound together in a special way – sharing electrons. The way that these molecules are bound together (called a covalent bond) gives water its special properties. Water is the only chemical that can exist on the surface of the earth in all three common states of matter – liquid, solid, and gas. Because of how water molecules share electrons between hydrogen and oxygen, they have a “positive” side and a “negative“ side, much like a magnet. The result is that these molecules are attracted to each other and align themselves in a certain way; because of this attraction water forms drops and rises up in straws due to its high “surface tension”. This property leads to why ice floats. 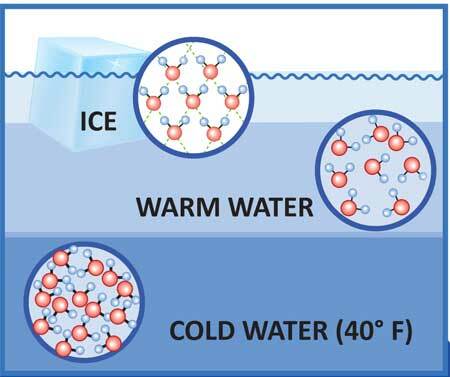 As water cools, the molecules come closer together (increasing density) to a point. Water is most dense at about 40 degrees F (4° C). As water cools further, the thermal (heat) energy that causes the molecules to move around is overwhelmed by differing electrical charges of the oxygen and hydrogen atoms. The hydrogens push against each other, aligning in a certain way as ice crystals form, expanding about 9 percent and making ice about 90 percent as dense as water. Water is a unique chemical. Most liquids get smaller when they freeze, which means the solid form is denser. When water freezes, it gets larger. It still weighs the same, but it takes up more space, which means it is less dense. That is why ice floats in water. Fill the glass almost full of cooking oil. Gently add an ice cube to the glass. The ice should float. If it doesn’t, try using a different kind of oil. Oils like canola oil may not be dense enough. Observe what happens when the ice begins to melt? 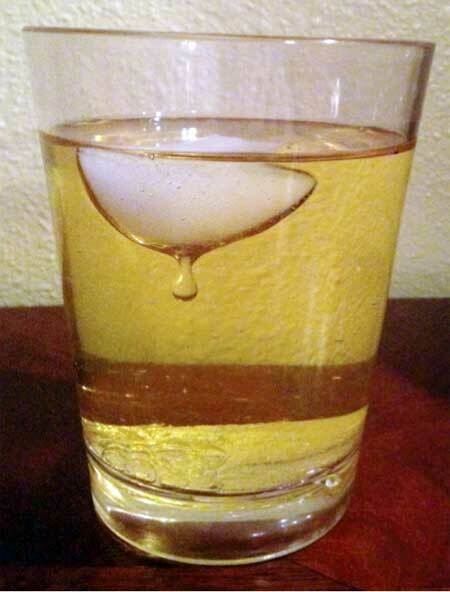 As the ice begins to melt, you will see a drop of water hanging from the bottom of the ice cube. 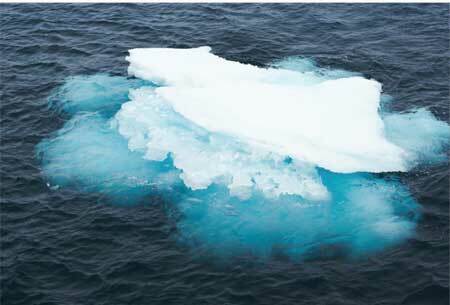 As the drop grows, the ice cube will float lower, as it is being weighted down by the denser, cold water. Finally, the drop gets large enough to pull free of the ice and it slowly sinks to the bottom of the glass. Can you reverse the process by freezing the water and the oil? Place the cup in the freezer overnight. What do you observe 12 hours later? Di d the ice float? The water drops should cohere (join together), freeze and be floating at the top of the cup after 12 hours. However, if you see the ice at the bottom of the cup, it may be that the surface tension of the water was strong enough to keep the ice from rising up through the oil. If so, gently warm the glass to free the ice and allow it to float to the top. ← How do bees make honey?